Time for a rock music post. I admit, I was born in the 1970s and am still young enough that maybe I should pay more attention to what’s hip and happening now in rock. But my head was always stuck in the 60s and 70s and still is to some extent. I must have investigated every lead in trying to find the overlooked gems of those heady, artistic times. 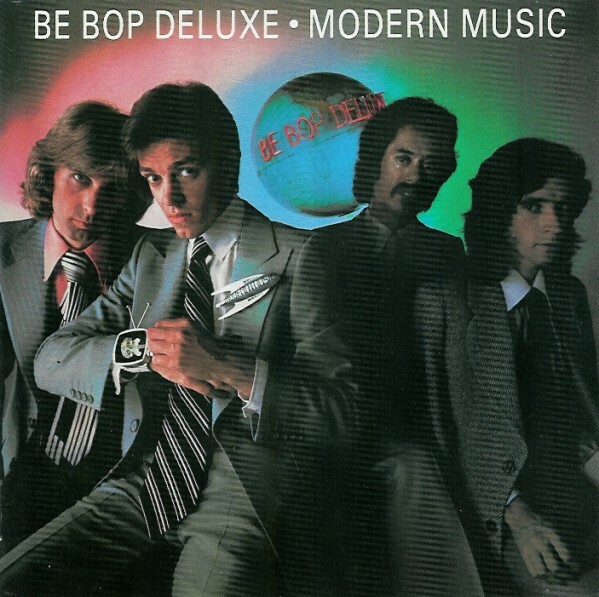 Be Bop Deluxe was one of those bands whose CDs I’d see in stores and wonder what the heck it was all about (Barclay James Harvest was another such band – I’ll get to them). One day I was in a used vinyl shop and took a chance on a $5.00 LP of Be Bop Deluxe’s Futurama. To say I was impressed would be like asking if the Tea Party is bad for women’s rights: YES! Here was a band that combined all the best aspects of mid-70s rock music in one amazing package. The band was led by virtuoso guitarist and singer Bill Nelson. And I mean this guy could play rings around anyone, with both lightning-fast jazzy runs and softer textures. But the great thing was that every little part just fit perfectly – as fast or flashy as the playing seems on the surface, it doesn’t coming off as a guy showing off his chops, more just like a big kid having fun with the talents God gave him. He wasn’t as good a singer as he was a player, but his voice is perfectly pleasant and does no disservice to the music. Even more impressively, the hot-shot playing was evidently quite secondary to the meticulously planned music. In the band’s prime, BBD mixed the best elements of glam (the showmanship and pomp) with artier, proggier musicality and just a touch of a foreshadowing of the tougher sounds of New Wave (which, in fact, Bill Nelson would later pioneer without proper recognition). The proper adjective for this music is “classy”. Not perhaps the way some people like their rock music, but I’ve never cared for all that macho sleazy nonsense anyway. Nelson was an intellectual and made no efforts to disguise it. But in addition to being classy, Nelson was unpretentious, and the other overwhelming feeling you get from the band’s music is sheer fun – the fun of making glorious, beautiful noise. Phew. So you get it, I love Be Bop Deluxe. How, considering they were with EMI, did this band not sell trillions of records? I dunno. To me, Modern Music summarizes everything nice I’ve just said. The band’s first effort, Axe Victim, is a slavish rip-0ff of Ziggy-era Bowie. Some good tunes, but not the best. Futurama is truly great and the next album, Sunburst Finish, contains a hit or two but feels like too much of a reach for popular success. Modern Music is where the formula was perfected. The cover reflects Nelson’s interest in 1950s-style sci fi projections of future utopias, and the music is pretty similar too. Right from the cracking opener, “Orphans of Babylon”, to the massive pomp power balladry of “Down on Terminal Street”, the album is a romp through the arena-rattling styles of the best of mid-Seventies rock, but never losing that cheeky sense of fun that keeps it from turning into something too serious. The centrepiece of the album is a linked suite of songs that seem to detail Nelson’s wry observations of visiting and touring America. If you like 70s rock but have never heard Be Bop Deluxe, you are in for a treat. Go get a hold of some of this music and you will thank me eternally. I should add in closing that Nelson is still highly active in his home studio, sometimes releasing several albums a year. He gave up on guitar hero-ing after some of those early New Wave albums I mentioned and has also made some great ambient music albums, in addition to continuing to write and record songs. His continuing presence as a recording musician is an inspiration to iconoclasts everywhere.